Whether you’re at a large gala, intimate gathering or a cozy night at home — your New Year’s Eve countdown absolutely must have bubbly. And you know what is the perfect accompaniment to bubbly? 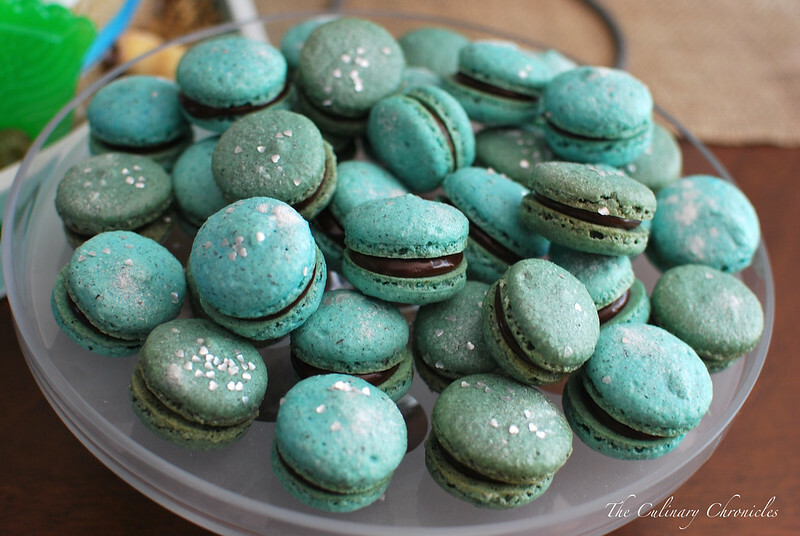 Parisian Macarons of course! The sweet little gems are a wonderful pairing to the dry sparkling wine. An absolute match made in heaven. 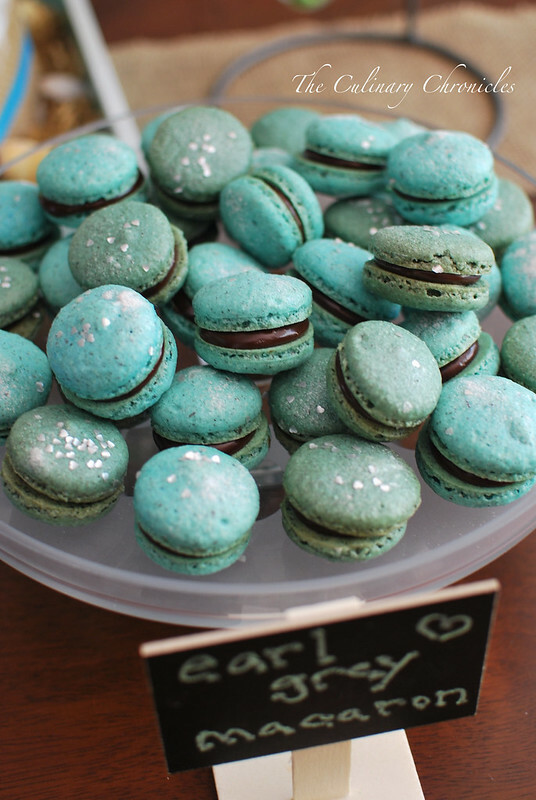 Ever since I started baking macarons, my seester T had been trying to convince me to make an Earl Grey version — an homage to her favorite macarons from Bottega Louie in LA. This past summer, I finally was able to get the proportions down and they even made an appearance at my seester P’s baby shower. The shells have a great floral scent with a bit of spice–stemming from the bergamot of the tea. The little specks of tea with a sprinkle of disco dust add to the charm to the shells as well. I know I have a propensity towards filling almost all of my macarons with chocolate ganache, but I promise, it really is the perfect filling for the Earl Grey flavor. But if you prefer a non-chocolate approach (which is both strange and crazy to me), I’d recommend a myer lemon curd or even an Earl Grey Buttercream. However you choose to fill it, you must have these little beauties for your countdown to 2015. What better way to ring in the year than with the perfect little sweet treat. And with that dear friends, Happy New Year!!! If using blanched almonds, pulse the almonds in a food processor until it becomes finely ground. In a spice grinder, grind the tea leaves into a fine powder. In a bowl, sift together the ground almonds (or almond meal), tea powder and the confectioner’s sugar. Set aside. In a mixing stand fitted with the whisk attachment, whisk egg whites until frothy. Slowly add granulated sugar and continue beating until stiff peaks are formed. Carefully begin incorporating the dry mixture into the meringue, gently folding until all items have been integrated and a smooth batter has been formed. Optional: Halfway through the folding, add in the food color. Using a pastry bag fitted with a large round tip, pipe small rounds of the mixture onto baking sheets lined with silicon mats. Rounds should be about 1-1½ inches in diameter. Once the baking sheets are filled, carefully tap the sheets on the counter to remove any possible air pockets. 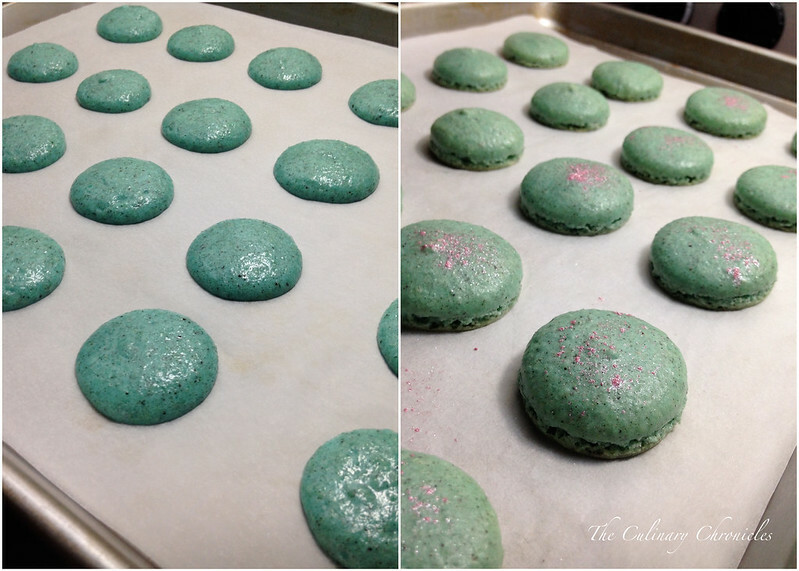 Let the macaron shells sit on the counter for 45-60 minutes to harden the outer shell before baking. Humidity will affect how long it takes for the “skin” to form but the shells should not be sticky when you gently touch them. Optional: If you choose to use edible glitter, sprinkle on the shells after it’s dried for 15 minutes. Bake the shells at 290 degrees F for 18-20 minutes. Transfer the baking sheets to cooling racks and cool completely before removing shells. 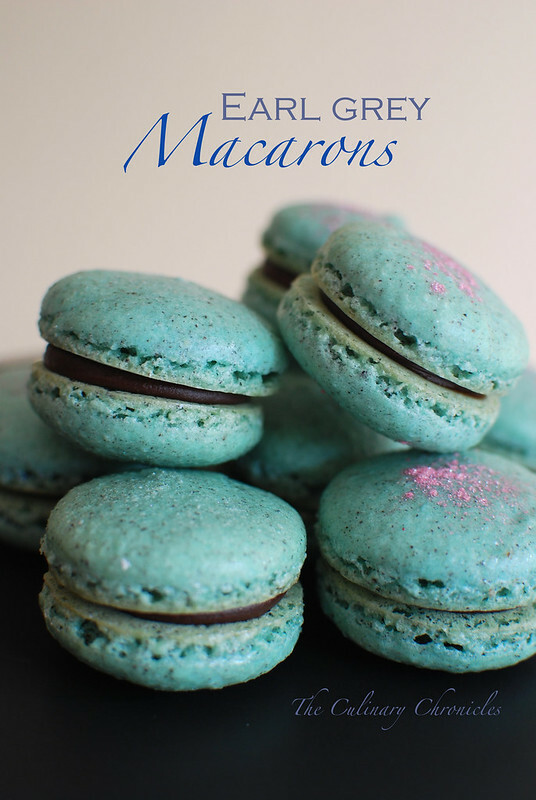 Macarons shells can be made up to 24 hours in advance before filling and should be stored in airtight containers. In a small saucepan, bring the heavy cream just to a boil. Remove and pour the scalded cream through a fine-meshed sieve directly into the bowl of the chopped chocolate. Let the mixture sit for 1 to 2 minutes and then gently whisk until the ganache is smooth and glossy. Allow the ganache to sit for 20-30 minutes at room temperature until it becomes thick enough to pipe. 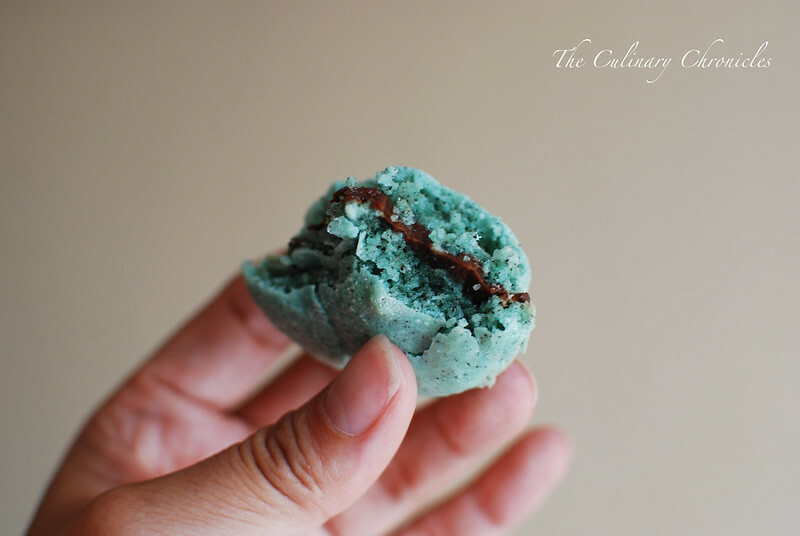 Fill the flat side of a macaron shell with ganache and sandwich with another shell. Filled macarons can be kept up to 2 days in airtight containers.